This problem probably happens most often with door hinges and latches, but some of these solutions can even work for guitars. With heavy doors, hinge screws that only penetrate the 3/4" door frame isn't enough. Note: Don't over tighten long screws that go into the framing behind the jamb. You risk messing up the alignment of the door frame. Consider using a longer screw that will reach sound wood. 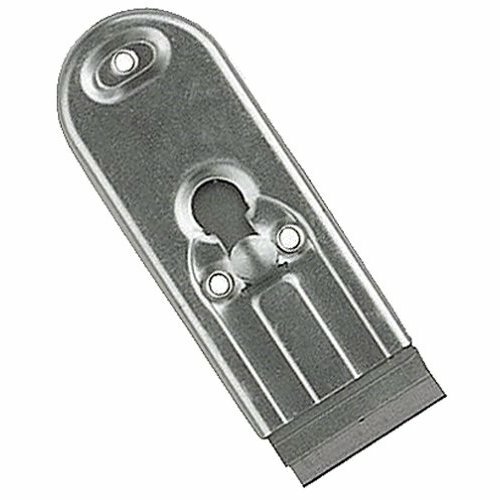 If it is a door latch/strike plate on the door jam it's often recommended you use 2"-3" screws to anchor it to the studs behind the jam anyway. If a longer screw won't do it, and the situation permits, how about a little larger (in diameter) screw? The most common fix for simply replacing the stripped screw is to put a little white glue in the hole and then fill it with toothpicks. I break the round ones in half, stick the broken end into the screw hole (to avoid the narrow tapered tip) then push the tip to one side to break it off in the hole. Keep adding pieces until the hole is full. Then I tap a pointed end into the middle to wedge/clamp the pieces tightly. Wipe off any excess glue. Wait an hour or so for the glue to dry, trim off the protruding ends with a chisel, utility knife or razor blade knife and sandpaper. Use an ice pick, awl or small drill to make a pilot hole in the toothpicks and put the screw back. Don't use match stems unless you have to. Toothpicks are made from hardwood -- match stems are not. Perhaps a better solution is to use a wooden golf tee. Again, put glue in the hole and a little on the end of the tee, tap it into the hole and proceed as described above. I use wooden chopsticks from my favorite Chinese restaurant as small dowels for a variety of purposes. If the screw is large enough, or you want to whittle it down you may be able to use a chopstick for this. I understand a modern version of this is to use pieces of plastic cable ties instead of toothpick. Some people suggest packing steel wool in the hole. I've never tried this, but if you're in a hurry you might want to try it. Steve writes: "I live in a house built in 1890 and was having problems keeping fasteners in the plaster/lath walls for any heavy object. My local "mom-n-pop" hardware store suggested I try something called "lead wool". It's like steel wool, but made of lead! Huh? Bottom line, I stuffed the enlarged hole with the stuff and now, several years later, it appears to be holding strong!" I've read where people fill the hole with hot melt glue from a glue gun. If the holes are large or if it's important to have a secure fix, drill the holes larger with say a ¼" drill and drive quarter inch dowel in the holes using the above procedure, then carefully locate the centers of the hinge screw holes, and pilot drill for the screws. If it has to hold really well and you can get to the other side of the piece of wood, drill all the way through and use a machine screw and a "tee nut" (threaded metal insert).